At least 79 people have been killed and 151,000 acres burned so far in California's deadliest-ever fire. Twin storms are headed for rural Northern California this week, bringing conditions that could both help and hinder efforts to put out the Camp Fire, the deadliest blaze in the state's history, officials said Monday. Heavy downpours are predicted for Paradise, California, and surrounding areas, where at least 79 people have been killed in the wildfire that’s been raging for nearly two weeks, authorities said. The statewide death toll is at 82, with three people dying in Southern California. The first rains are expected to hit on Wednesday morning and to continue until a brief respite on Thursday afternoon or evening, according to NBC meteorologist Kathryn Prociv. Then another round of showers is forecast to come Friday and last through Saturday morning, with the two storms together bringing between at least 1 inch and as much as 3 inches of rain, Prociv added. The precipitation itself won’t put out the fire, but could moisten the earth and slow the killer blaze’s spread, Sacramento City Fire Capt. Keith Wade told NBC News on Monday. “Will it (rain) extinguish the fire? No. But it could hinder its ability to spread,” said Wade, who is in Butte County helping local firefighters. The problem could be if rain totals push beyond 3 inches. That's when rivers and streams could flood, and rain-soaked earth could become mud capable of trapping firetrucks. A potentially worst-case scenario from the combination of fire and rain would be killer mudslides akin to those in Santa Barbara County earlier this year, according to Prociv. At least 21 people were confirmed dead and two remain missing from those mudslides that devastated the upscale community of Montecito in January, a Santa Barbara County fire spokesman said Monday. The disaster happened after the massive Thomas Fire weeks earlier consumed more than 280,000 acres, stripping land of trees and weakening soil. Then about 2.5 inches of rain triggered the mudslides. “When you lose all of your trees and your root system that soaks up all the water, you lose your ability to stop boulders and other debris from falling downhill, Prociv said. 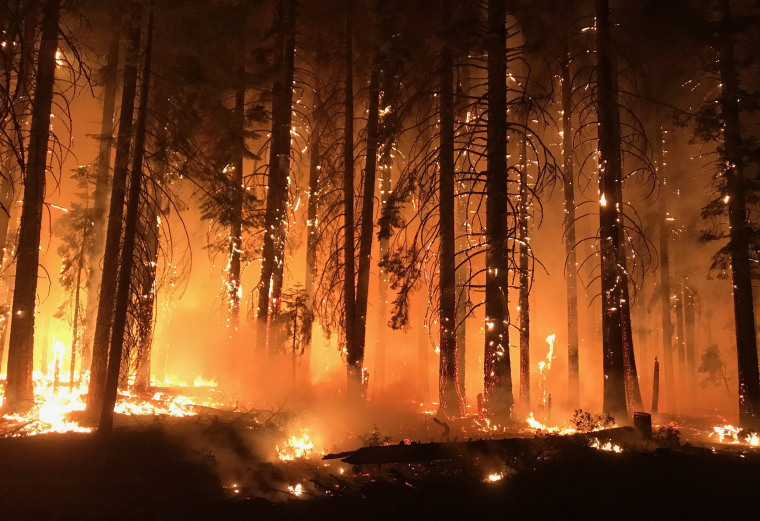 The Camp Fire in the rural northern part of the state has been burning since Nov. 8 and has charred at least 151,000 acres and leveled virtually the entire town of Paradise, authorities said. It was 66 percent contained as of Monday morning. At least 11,713 homes and 472 businesses have burned down. The number of people still missing after the blaze was 699 on Monday night, down from nearly 1,300 a few days before.